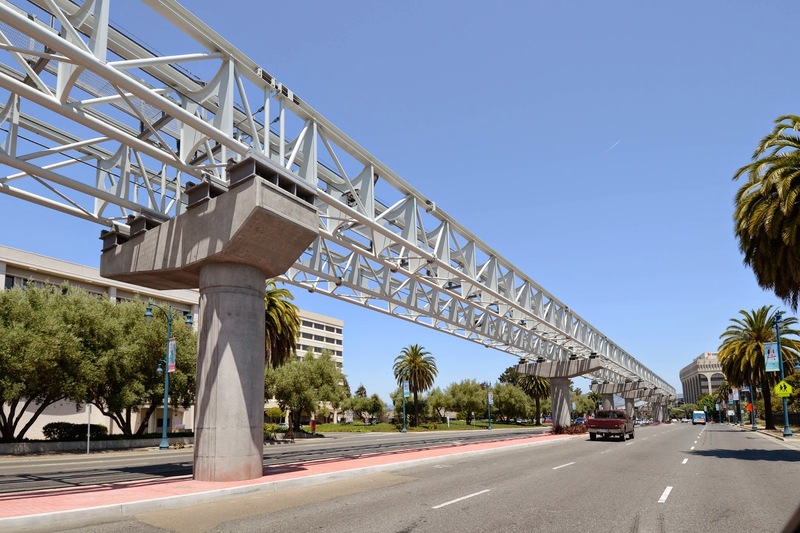 This recently built structure carries automated cars between BART's Coliseum Station and Oakland's Airport. It's a patented system and so BART gave Doppelmayer a license to build and operate it for a number of years and keep the profit. These things aren't very attractive and they're multiplying all over the planet. A cookie cutter approach means they don't fit that well into their environment. For instance, they're not designed for the large earthquakes that can occur in Oakland. The columns are non-ductile but the connection between the steel structure and the concrete bents are designed to slide before the columns fail. Alameda County, California Bridges: Oakland Airport Connector by Mark Yashinsky is licensed under a Creative Commons Attribution-NonCommercial-NoDerivatives 4.0 International License.